The most impressive thing about this list was that the Fish had 3 in the top 4. And all three of those Marlins are two-time all-stars for the Marlins. Ramirez and Uggla have both represented the team in the home run derby, and were both part of the 2008 record-setting infield. That year the Marlins’ infield, consisting of Ramirez, Uggla, Mike Jacobs, and Jorge Cantú, became the first ever to hit 25 home runs each in the same year. They narrowly missed out on 30 as Cantú ended the year with 29. Josh Johnson has stenciled his name into the yearly pre-season Cy Young candidate list. Unfortunately, mid-season injuries have hindered him from receiving that award. Scott Olsen ad Josh Willingham were of course dealt to the Washington Nationals following the 2008 season. Both lost their true form and are no longer in D.C.. Anibal Sanchez is still dealing with the Marlins. He has their most recent no-hitter, a 2006 blanking of the Diamondbacks. 2006 was a great year for Florida. The young starts they brought up solidified into the core of a young team with great potential. Unfortunately for believers, though, money got in the way and the core started breaking apart. Dan Uggla was traded to Atlanta after the 2010 season due to a stall in contract negotiations. The veterans of 2006, Miguel Cabrera and Dontrelle Willis, were traded after the 2007 season because they became too expensive. The Marlins have always been reliant on their productive farm system, but could never pay their flourished stars…until now. 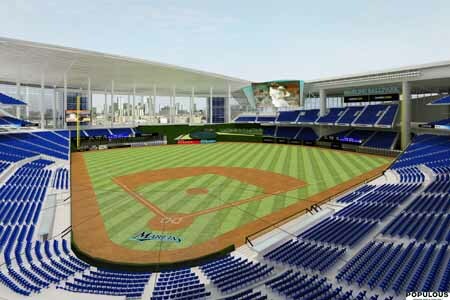 Since the Miami Marlins will finally be making their own stadium revenue in 2012, they have the money to splurge and pay seasoned stars from their farm system. But instead of being smart, it looks as if the front office now thinks they are the Yankees and are focusing on picking up free agents. The Marlins’ double and triple-A teams are stocked with talent, talent that could turn into Miguel Cabreras or Dontrelle Willis-s.
Basically, the front office wants the 2012 starting lineup feature two or three pricey free agent acquisitions who were unnecessarily acquired in the offseason. Instead of bringing up Chris Coghlan this month, Mike Cameron, who is most certainly NOT going to be in next year’s starting lineup, is still getting everyday playing time in centerfield. I am almost certain that the Marlins want to have Coghlan flourish into a star who deserved the 2009 NL Rookie of the Year award, but instead he is rotting in the minor leagues. Javier Vasquez will most likely not be in the starting rotation in 2012, and the Marlins have expressed interest in picking up a premier left-handed starting pitcher in the offseason. In triple-A New Orleans, Sean West is waiting for a call to join the big leagues. The 6’8″ lefty made appearances in the 2009 and 2010 season and looked to be the ace of the future for the Marlins, but for some strange reason he is still in the minors. The same can be said about Alex Sanabia who made starts last season for the Marlins, and proved to be very effective. All six of those starting pitchers are capable of filling the rotation, but the team will most likely settle for five to start the year on the big league roster. The 2006 Florida Marlins team featured a group of young stars. Those players are now seasoned veterans and are joined by new prospects fresh from the minor leagues. Hopefully they will find chemistry good enough for the team to finally make a playoff push in 2012. Wow, I didn’t even realize how strong the Marlins’ rookie class was in 2006. Looking forward to a bright future under Lo-Mo, Stanton, and JJ and hopefully one without Loria and the new Marlins logo. Hi, thanks for the comment. I too am looking forward to the future. I’m not a huge fan of Loria, but I don’t think he detracts from the team too much. The real problem this year was in the injuries to Hanley and JJ. But you’re right, the future lies in Morrison, Stanton, and Sanchez, along with the veterans like JJ and Hanley. With you all the way on the logo!